That led to a complaint by someone who wanted to silence even this type of personal expression. Adding to the bizarre aspect of this investigation, the complainant reportedly said that he was not offended. Putting aside the loony aspect of the complaint, it is chilling that police would investigate such a frivolous and abusive claim. However, the problem again is the law which criminalizes any comment ” that is grossly abusive or insulting in relation to matters held sacred by any religion, thereby causing outrage among a substantial number of the adherents of that religion.” I am not even sure what that means. “Grossly abusive or insulting”? We have previously discussed Ireland’s ignoble status as a Western nation that has dabbled in blasphemy prosecutions. In 1999, the country’s blasphemy law was found to be incompatible with the Constitution’s guarantee of religious equality. Belated but true. However, a new offense was crafted for the “publication or utterance of blasphemous matter.” For many years, I have been writing about the threat of an international blasphemy standard and the continuing rollback on free speech in the West. For recent columns, click here and here and here. Don’t forget that Ireland, until well into the Sixties, remained a backward, impoverished backwater on a par with countries such as Portugal! I think god and Jesus are two of the most unpleasant characters in fiction. Carl-Edward – can you prove that both God and Jesus are fictional? I can’t wait for the day that Muslims in Ireland (and the rest of the Western world) start stoning idiots like Stephen Fry to death. The reaction in the press ought to be a hoot. What the hell does your reply have to do with his comments? Total disconnect. If you’re really that paranoid about Muslims, at least save your comments for posts where they can pretend to make sense. I am not so sure that this prosecution,if initiated,would be found to offend Art.10 of the European Convention of Human Rights to which Ireland is subject:see Otto Preminger Institut v Austria,September 20,1994.In that case,the majority of the ECHR panel found that a privately-screened film ridiculing the widely-held religious sensibilities of the Roman Catholic population of the Tyrolean region offended their Convention-protected right to religious freedom and accepted the national courts’ finding that the blasphemy prohibition was “necessary in a democratic society”. It’s correct, people do disagree. Until goddesses and gods fill out the complaint form, and show up to testify how they were harmed, then religious belief is not a matter for the govt. to enforce. Blasphemy laws force everyone to be religious or to pretend to be so. That’s such an ugly vision of a society. It’s exactly like having a dear leader about whom no ill may be spoken. That is your belief. Others would disagree and say that religion was handed down to us. How we handle what was handed to us, is up to us. Religion must be respected: Look at all the peace such belief brought Ireland during the Troubles. Religion in its various, inconsistent forms is actually blasphemous to human intellect and decency. Moreover, Dominists in the United States, like those in the Rose Garden last week, are attempting to influence legislation (and certainly once-hated executive orders) to isolate and insulate their sacred nonsense, and should be met with equivalent disdain and resistance. Yes, because atheists have such a great historical record too. Man is the problem, not religion. Remove religion from the people and you will replace it with something even worse, the govt. “Man is the problem, not religion.” And man invented religion. Theocracies are based on what, atheism? If ever there was an argument for the fact that mankind created religion, god(s), the stories, etc in its image(s) not some bearded sage throwing dice, then it is to be found clearly stated in Fry’s observations. That is what scares the Catholic Church and Ireland is more Catholic than free from its fantastic origins. If ever there was an example of how weak religion is it is this sort of protection it needs from secular laws. The greater the lie, the greater the need to protect the lie. When illusion and double talks fails, in come the soldiers. However, one may also measure how this nonsense is fading by regarding history; not too long ago Fry would have been burned at the stake or jailed, not that long ago. It seems that the desire of some people to control other people supersedes rational justification. Many laws are made and enforced for no other reason than to demonstrate control over some by others. The weaker the logic of the law, the more obvious the hierarchy of power. I’m a little confused, is the Catholic Church opening an investigation or is the govt.? A scenario for how hate speech laws will come to the United States. And make no mistake, they are coming. Ahead of the British general election on June 8, Facebook has deleted tens of thousands of accounts in Britain in its ongoing battle with “fake news” the AP reports. The campaign is part of Facebook’s evolving response to accusations the group was responsible for influencing the US presidential election, through the spread of fake news stories and “filter bubbles”. I am against restricting speech, no matter who does it. Not picking on the left exclusively. When Bernie Sanders spoke at Liberty University, he was treated with courtesy and respect. When Ann Coulter tried to do so at Berkley, did she receive the same reception? Tell me, is there the conservative equivalent of the “antifa” who go to universities or other public forums and seek to assault others who have the “wrong” opinion on various social issues? “Free speech for me, but not for thee.” or “My violence is speech, your speech is violence” Nice slogans from our friends on the left. I defended Coulter’s right to speak and thought the actions to shut her down were terrible. Historically, the right wing has engaged in shutting down speech. This still occurs on the right. However, as of now, this behavior seems to occur far more frequently on the “left” end of the spectrum. I think this is repulsive and people who engage in violence at protests because someone is speaking whom they don’t like should be arrested. And I commend you for defending Ann Coulter’s right to speak. Actually I think the question is rather silly and shows the lack of understanding of free will. God doesn’t grant wishes or make our lives a struggle, we do that to ourselves. Jim22 – this depends on your concept of God and the responsibilities of God. I’m not sure I would feel God is responsible for anything other than allowing us to be good or bad. How we choose to use that responsibility is up to us. I’m thankful for the choice and pray I have the strength to deal with what life has to offer and hope (I choose the word hope on purpose) that humanity picks good over evil. Your response isn’t getting to the real problem here. You may think this is silly and you have a religious concept about how your god runs the world which other religious people don’t necessarily share. The real problem is putting a person on trial for speech. Whether you think it is silly or not, this should offend you and you need to defend Fry’s right to say “silly” things. It is a mistake to believe you might never be accused of this yourself. Your views are shared by the religions of the book. They are not shared by other religions nor even by all of the people of the books. Some day, you might be in a situation where people who don’t share you views accuse you. If you can’t stand up for what is right because it is the just thing to do, then maybe some self interested thinking such as– if I don’t stop this now, it could happen to me, is in order. Please point to were I wrote that Fry didn’t have the right to say whatever he feels. I believe he has the same right as does a racist. And I think both say idiotic things. My beef is when a Turley writes, “He answer was honest and though-provoking: “. I don’t feel it is thought provoking at all. Blaming god for mans failures shows how ignorant one is about the society that he lives. I, like most, have had tragedy in my life and I never blame God. If for no other reason, think just how boring life would truly be if God intervened on everything. If God’s wrath is truly that powerful why wouldn’t people just go on believing that final justice will prevail for those sinners and just leave the heathens be? Does a omnipotent being like any particular religion’s deity need mortal man to protect it from slander? Sorta like the way Israel apparently needs the US to protect it from all their haters. Similarly, I’ve always wondered if people who say, “God Bless you”, believe that it is their responsibility to tell god who she should or should not bless. Apparently, God is one of the snowflakes! 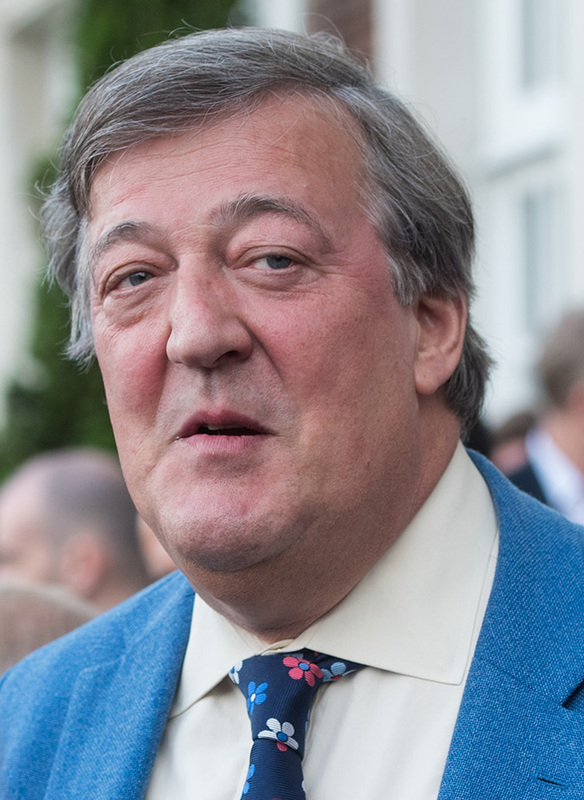 If Jesus could ask, “Oh God, why have You forsaken me?” on the cross, then why can’t Stephen Fry? It’s natural to question the mad world, whether you’re religious, atheist, or agnostic. If such a statement as Fry’s could land him in criminal trouble, then the commenters on this very blog would be raided by the Gestapo routinely. This is a good reminder of why the US should vigorously fight efforts to create blasphemy and hate speech laws. They all inevitably lead to restrictions on thought and expression, the most basic freedom there is. I agree with David. Yours is a good comment! It seems from at least what has been in the news the past several years is that the probability of being prosecuted for criminal blasphemy is directly proportionate to the level of fame or the public profile of the accused. In other words, the wider the audience, the more the effort to silence the speaker. I wonder if that’s why Bridgette Bardot keeps getting hefty fines in France. A measure I have for whether a particular government or society is authoritarian is how likely the average person can be thrown in jail for minor issues that are outside the realm of traditional criminal laws–robbery, theft, assault. Nearly everyone is aware in all societies that those three acts and others similarly codified are illegal, but when a person is arrested simply for expressing an opinion or in essence “doing nothing wrong” their government shows signs of authoritarianism. It is also a sign where enforcement or penalties are levied based upon how much the government doesn’t like a citizen. Partly yes, I think so. But a fw years ago I also discovered that her husband (at least at that time) was/is a wealthy German industrialist who is also a long time advisor to Marine Le Pen. So between high profile and that association… she gets served up. she goes in, pays the fine and comes out.